Our 101-in-1001 deadline is drawing near, and I’ve already accepted the fact that we just aren’t going to complete all 101 things on our list. We might have gotten there under normal circumstances, but moving was a fatal disruption to some of our list items. However, I’m quite satisfied that Bart and I will have accomplished 101 very interesting things in that time frame, just not every last one we set out to do back in 2011. It has accomplished its purpose of making us intentional about the things we say we want to do. I haven’t totally given up on the list, though. In fact, just this week I finally completed another item, #82: read another book by Brandon Sanderson. You may know him as “the guy who finished writing the Wheel of Time after Robert Jordan died,” and, I’ll be honest, that’s where we first learned of him. However, he is a fantasy writer in his own right with quite a few original novels and series of his own. Bart and I have read most of them to date, and it seemed like an easy enough goal to tack on a new one when it came out. Sure enough, a couple of years ago Sanderson released “Alloy of Law” as a complementary book to one of his best known series, Mistborn. It’s not a sequel, just a separate story set in the same world. We got it, and Bart read it immediately. However, I tried three separate times to start the book and for some reason every time I got distracted before I could finish the first chapter. Finally, last month when I had jury duty, I picked it up again, determined to succeed this time while I was a captive audience in the jury waiting room. However, I’m afraid I was going to get distracted yet again until Bart intervened. He happily volunteered to read it together with me, so over the course of a few weeks, we read it aloud together in the evenings. We finally finished it on Tuesday night. It was a good story, so I have no idea why I kept putting it off! Plus, compared to every other fantasy novel I get sucked into reading, it was only 300 pages or so instead of 600 or 700. So I had no excuse before, but I’m finally off the hook. I’ve decided that I cannot recommend “Alloy of Law” to anyone who has not read the original Mistborn trilogy. However, I cannot recommend Mistborn highly enough. I really don’t read a ton of fantasy series, but I personally found it to be one of the most unique and interesting premises I’ve ever come across. Sanderson takes an unconventional approach to “good guys” and “bad guys;” where sharp lines are usually drawn between camps in most stories, he blurs and greys the lines and leaves you guessing until the end. I found it to be a refreshing departure from the predominate type of stories and worlds one tends to find in the genre. But once you’re familiar with the world of Mistborn, “Alloy of Law” is an engaging exercise in exploring the same world with the same magic system, only in a different culture a few hundred years later. The original Mistborn is set in a traditional fantasy kind of world, with largely pre-industrial civilization and technology. “Alloy” is set in a late-1800’s or turn-of-the-century type era, with fledgling technologies like automobiles and electricity; it almost has a steampunk feel to it. The plot and characters are fun and engaging, and not intended to be developed in the same depth as the original series. It’s by no means superficial, but it’s an easier read with less commitment than, say, Wheel of Time. :p So, go read Mistborn right now, and then read Alloy of Law after that. Of course, why read just one book when you can read two? Brandon Sanderson released a new book, “Steelheart,” just last week. Bart insisted on picking it up, and we’ve started reading it together the last couple of nights. This is the first book in a new series, and it’s completely different from Mistborn. It’s set in future Chicago where evil anti-heroes control and oppress the population, but one group of ordinary humans still fights back to overcome these “Epics.” We’re only half-way through, but we like it, and so far I can recommended for another fun read. If I finish, can I check another item off my list? You can check out Brandon Sanderson and learn more about his writings at www.BrandonSanderson.com. In principle, I actually kind of like moving. My family moved every few years when I was growing up, but never further than a mile or two away (my mom and dad built houses as a side job, so they would build us a new one every so often). As a kid, all I was responsible for packing was my room, so that took very little time and left plenty of mental bandwidth for excitement: thinking about what color to paint my new bedroom and exploring the neighborhood. I also enjoyed going through my stuff, tossing what I didn’t need, and making everything streamlined and efficient (yes, I’m weird; that’s probably why I ended up as a physicist). Then, in college and grad school, I got in the habit of moving once (or twice!) a year. I still got enjoyment of changing my surroundings and living in new spaces as well as lightening my load a bit. When you live in the dorm, you don’t generally even have your own furniture, so during those years I prided myself in being able to put all my possessions into one car when the school year was over. Apartment living got a little more complicated, but even two bedrooms full of stuff wasn’t all that bad with a U-Haul and some help from friends. Once Bart and I got married, we moved apartments a couple of times before we finally settled into our first house. And then my eyes were finally opened. We didn’t have a huge house in Colorado, but it is amazing what you accumulate when you finally have some room, especially when you finally aren’t moving all the time. Aside from the essentials you had before in the kitchen and bedrooms, the bulk of new stuff is typically furniture and hobby stuff, which in our case includes a garage full of tools and two knitting machines. And these items tend to be the bulkiest and heaviest. Plus, it’s easy to accumulate even modest amounts of junk, even if you think you’re staying on top of it, as I have done in the past. But there is nothing like facing the reality of moving an entire house of stuff 1,600 miles to suddenly make you feel like you belong on an episode of Hoarders. Needless to say, our move last fall sucked the joy of moving right out of me. De-junking an entire house at once causes vastly more mental and emotional strain than one or two rooms. Handling heavy and bulky items with just the two of us was challenging. Cleaning 3 beds/2 baths/kitchen/basement/garage at once was mind boggling (and eventually left to professionals…it’s 100% not in my nature to pay for that kind of thing, but there was no way I could mentally deal with that at the end). Trying to fit the most fragile or awkwardly-shaped objects (like lamps, artwork, and tools) into boxes or wrap them carefully was nerve-wracking. And getting an entire house full of stuff packed efficiently into the back of a semi briefly challenged our sanity and marriage vows (but only briefly :)). In the end, we did manage, though I admit I was seriously more stressed while moving than when I was writing and defending my thesis earlier that year. And the biggest problem was that it wasn’t finished: we knew we’d be doing it all again when our lease was up and we bought a house. Which is now. Now that things are rolling on the house and we wait for the official closing, I’m finally having to accept the fact that it’s time to move again. Denial isn’t just a river in Egypt. But I couldn’t ignore it any longer after Bart retaped all our moving boxes this weekend. Well, rather than be in denial and be stressed trying to do it all at the last minute, I did what any self-respecting woman would do: I made a list. It’s on a marker board prominently displayed in our living area; each week we’re making a list of things we can pack and clean as we get closer to the date. That should keep us on track and accountable for not waiting until the last moment. 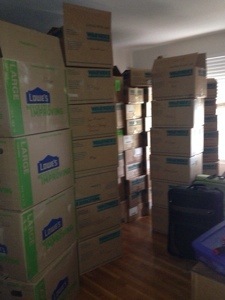 It does help that we didn’t unpack everything, so at least 30% of our boxes are already ready to go. And, even with as much stuff as we got rid of last time, we are now willing to part with even more, so we’ll be putting a few things on Craigslist and sending a lot to donation places (anyone need a Christmas tree?). 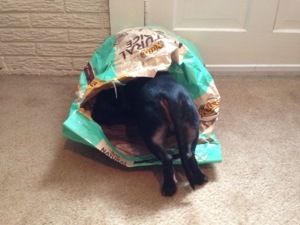 Earlier this week, we had our requisite home inspection. I left from work and went straight to the house, thereby having a preview of my afternoon commute. Of course, one lane of Rock Creek Parkway happened to be closed on this particular day, but I hope that isn’t a premonition of things to come. I’m not going to lie: the thought of forging a new commute route–especially through the middle of downtown, over a bridge, and down a parkway that switches to the opposite direction if I don’t leave early enough in the afternoons–plants a small pit of terror in my stomach. However, many people at work do it every day, and I’m more familiar with the area in general than I was ten months ago, so I think I’m going to be okay. It’ll just take a little time to acclimate. Bart and I were there for the entire four hours of the inspection. We were glad it was thorough, but we were absolutely exhausted by the time it was over. And to think…the inspector does two of these per day. More power to him. When inspecting a 52-year-old house, one doesn’t expect everything to be perfect. But, relatively speaking, it got a pretty good bill of health. There are a few minor things that we can handle ourselves, and we’ll discuss a couple of larger items with our agent tomorrow. Basically, it’s not falling down and the roof isn’t collapsing, so I think we can come to terms with everything else. 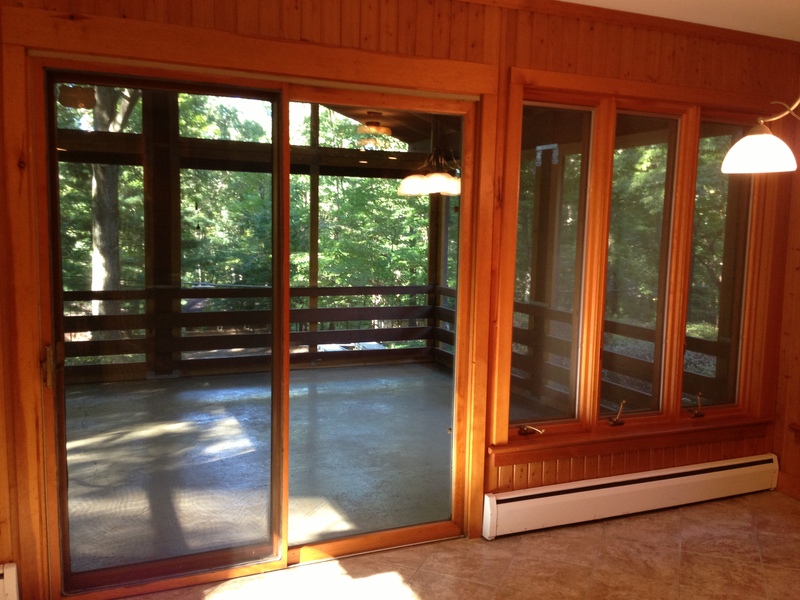 …and a very unique, gigantic covered porch in the front of the house, right off the kitchen/dining area. Screened-in porch in the front. The kitchen is a little small for all my gadgets, but it’s a nice, updated kitchen. I’ve got some ideas for paring down and organizing without having to compromise too much. Plus, never in my life did I think I’d have Wolf appliances. Wolf wall oven. It’s blue porcelain inside, people. Blue. 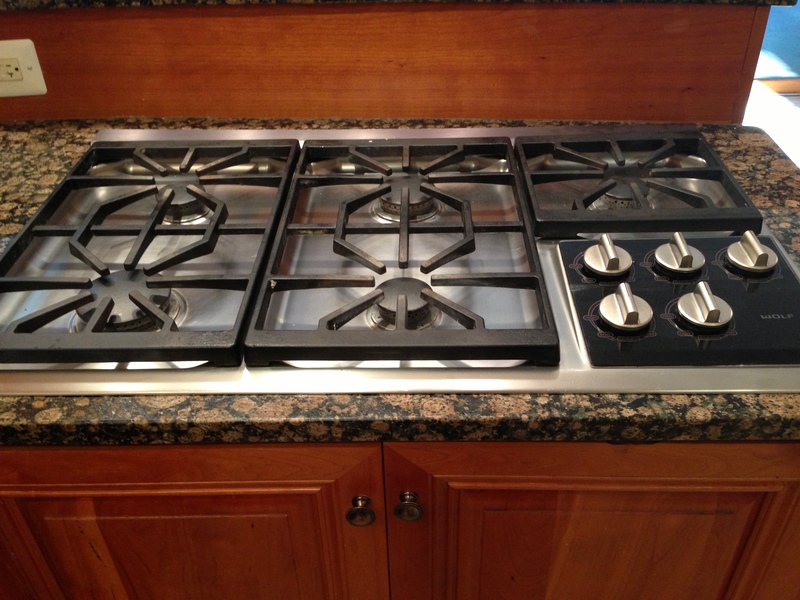 This five-burner gas cooktop and I are having a moment. It’s just a simple ranch, so it’s not a huge house. But it does have a relatively open living area, which is rare for a house of this age. 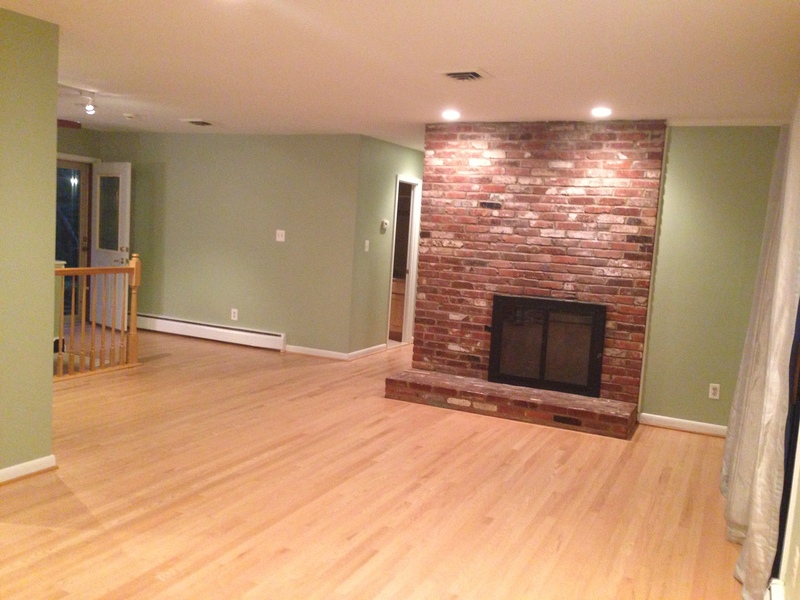 And for the first time, we will own a fireplace….and not just one, but two! We have one on the main level and another in the basement just below it. We’ve had fireplaces in rentals before, but didn’t have one in our previous home, so I’m looking forward to hanging our stockings by the chimney with care this Christmas….we just need a mantle on this one first. Open living area, and future stocking hanging location. All in all, the house has some great features that were unique and refreshing compared to week after week of identical ramblers and split levels that got churned out in mass quantities in the 50’s and 60’s in the DC metro area. However, being a house of this age, it does lack a few modern conveniences, such as large bedrooms and baths, a large kitchen, and ample closet and storage space. I’m a little bummed about those, but no house is perfect anyway, and what it does offer far surpasses what it lacks. Instead of feeling down about it, I shall instead rise to the challenge of making clever, efficient, and awe-inspiring storage solutions. We also look forward to fixing up the house with our own touches to make it our own. I know I can’t change everything that I would like to, but I am also up to the challenge of making a big impact with a few strategic changes. Pinterest and I have been gearing up, and it’s possible that I am a tiny bit addicted to a few DIY blogs, too. Our first instinct is to rush in with paint brushes and hammers in hand, and that’s exactly what we did with our first house. But, now that we’re a little older and wiser, we’ve decided to move first and live in it a little while as we assess what we’d like to do. There are certainly a few projects we will need to do immediately, so that should give us some time to really get a feel for living there and let that guide our personal finishes. Plus, it’s usually about the journey anyway, and not just the finished product. So, one more item down in our home-buying checklist. There are still a few more hurdles to cross, but every day more stuff gets done. It’s not over until the fat check is written and the dotted line signed, but hopefully it continues smoothly until the end. I’ve had a really hard time coming up with the right word to describe today. Awful, sad, frustrating, and overwhelming are just a few that have come to mind. I don’t work at the Navy Yard, but I work a few miles from it, and there is solidarity in sharing the sorrow of your fellow Navy folk, and we did experience some fallout from it. How do I feel? Maybe angry, but less angry at the perpetrator and mostly angry that our world is such that these sorts of things happen. I’m actually sad that this person ended up in a state where he felt like this was something he needed or wanted to do. And I’m sorrowful for the families of those who will never come home from work. Needless to say, with that distraction in our group, our heart wasn’t exactly in our work today. On top of that, Bart and I are embroiled in jumping through all the necessary hoops required for home buying. It’s been enough years since we bought our first one that I’ve forgotten all the oh-so-joyous splendors of titling, mortgages, inspections, and insurance. At last…….my house has come along! Yes, as of yesterday, Bart and I are officially under contract on a house. We actually had our offer accepted and were mostly official on Thursday, but there was one other piece of paperwork that needed to be signed, and that took the sellers over 48 hours to handle (not quite sure why it took so long, but whatever…at least it’s done now). After months of blind dates, a few rejections, and wondering if we would ever find the one, we realized that The Right House was actually there all along. Meaning it was initially priced almost $100k over market value and not even on our radar. I actually remember when it first came on the market; it was in a neighborhood that we really liked, but we were focusing our search in a lower price range. I MLS-stalked it a little as it dropped in price once. Then, a few weeks ago, it had a second, very significant price drop, right into our target price range. We had actually scheduled a showing for two houses one evening, and when one of them was sold right out from under us, we decided to tack this one on as a replacement, just for kicks. But when we walked in, we knew there was something about it that really resonated with us. Unfortunately, when we talked to our agent, he looked at comparable sales in the neighborhood and determined it was still overpriced. Since they had just done a massive price cut, we didn’t think the owners would be willing to entertain the price we felt like we’d have to ask for it. So we made a very tough decision and waited two full weeks to make a move. If it sold before that, then it wasn’t meant to be. If it didn’t sell, then we felt like we had more position to negotiate, since well-priced homes move quickly in this market. When we decided on our firm, top-dollar price, it was still so far below the current asking price that I wasn’t all that hopeful for outright acceptance. But the owners had already moved out, and it had been on the market for nearly four months, so we thought they would be motivated to work with us a bit. I can’t tell you how shocked I was Thursday morning when our agent said that they had flat-out accepted our offer. I seriously was dumbfounded. But hey, we’ll take it. I’m sure we’ll more formally introduce you to the house when we move, but here’s a general overview and some more interesting features. It’s a 1960’s ranch with a fully finished basement, 3 bed/2 bath upstairs, and a nice guest bed, bath, and kitchenette downstairs for when you come to visit. It has a two-car garage (routine and ho-hum where we’re from, but utterly luxurious here in DC). It’s on a wooded, half-acre lot on a dead-end street. 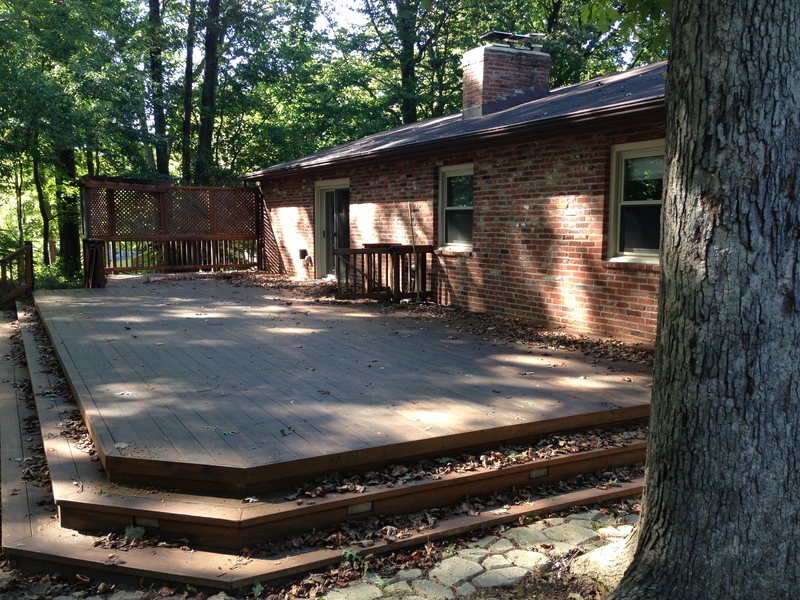 It has both a huge deck out back and a unique screened-in porch off the kitchen in the front. It’s a relatively easy commute into DC (at least during the hours I work). It has a newer kitchen and baths. 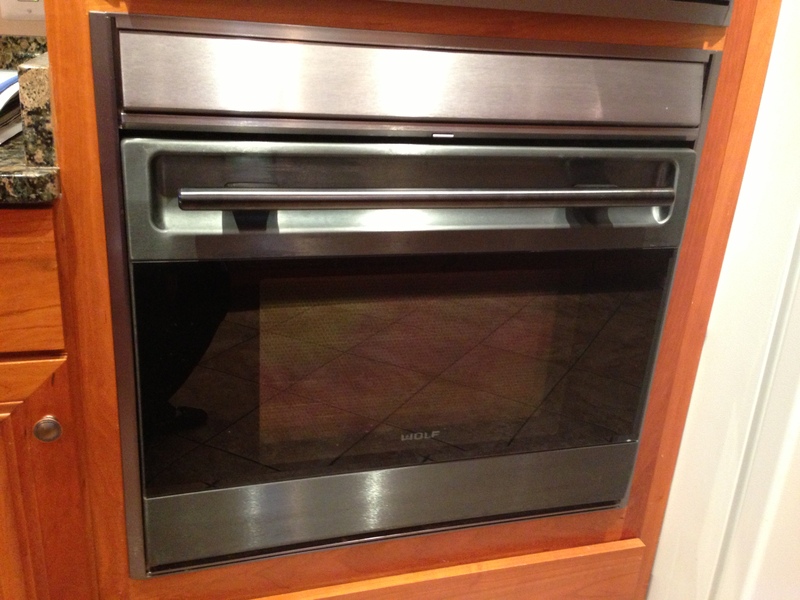 And, maybe most excitingly of all, it has a five-burner, gas Wolf cooktop with a down-draft vent system. Swoon. While it has some wonderful qualities, Bart and I realize it’s probably not going to be our forever house, and one day we’ll need to move on from here. But we think it will suit our needs for a number of years down the road. And while we’re under contract, we still have a few hurdles to get past before it’s official, namely the inspection and appraisal. So it’s not in the bag just yet, but hopefully it’ll be an uneventful process into October when we close. Now I’ve gotta start packing. Dang. Yesterday, Bart and I went out to one of our favorite local restaurants, Clyde’s at Tower Oaks Lodge. It’s sort of a fancy restaurant crossed with a woodsy lodge (and two bars…it’s always a hopping place). It’s one of those places you don’t go often, just for a special occasion or to take friends from out of town for a unique local experience. We didn’t have friends in town, nor were we celebrating anything specific, but we just decided to go anyway (probably influenced by the fact that they’re having lobster as a seasonal special right now). I decided we could either celebrating the ability to celebrate something, or we were celebrating what I eventually dubbed our “pain“-niversary (and I mean “pain” as in the French word for bread, not the English word with a bad connotation), since we were travelling to Paris a year ago yesterday. What we also didn’t know was that we had both gotten each other random gifts and just happened to gift them to each other on this day. I gave Bart a photobook from our trip; I had purchased a deal on Groupon for one a few months back and finally got around to having it printed and delivered a day or two ago. I thought our “pain“-niversary would be a good day to give it to him. Bart, in turn, found a deal on some flowers, so he ordered me a dozen multi-colored roses that arrived yesterday. That was very thoughtful of him! I definitely needed a smile. I suppose we inadvertently were celebrating ten months of being here. Ten months sneaked up on me this week, probably because my mental bandwidth has been consumed by other things the last few days. But today marks 5/6 of a year since our move. One year ago today, Bart and I boarded a plane to Europe for a two-week graduation present to celebrate my recent PhD. I’m not going to lie–spending 14 days in Europe in 2012 was awesome, but it was even more awesome because we skipped two full weeks of incessant presidential race coverage (with one small exception while we were in Zurich, which is a great story you should ask me about sometime!). However, we were also largely unaware of the events unfolding in Libya as we were boarding our plane that day. The harsh reality of current events, both presidential and otherwise, crashed back to us upon our return. We felt our greatest tribute that day was our simple act of boarding an airplane. Eleven years prior, such a simple act changed America’s way of life forever: what better way to thumb our nose at terror than to not be terrified to live our lives. Twelve years ago today, I was a sleepy college student, struggling to wake up for my physics lab that Tuesday morning, when my roommate came back from the dorm bathrooms and turned the TV on in our dorm room. Why she would do such a thing was beyond me, but through my grogginess it was clear that something life-changing was happening. That day, and following days, at the university were surreal. I was supposed to have a quiz in Calc 3, but all we could do was stare at the repeating coverage on the TV that was on in our room; nobody could bear to turn it off. Work was suspended, activities cancelled; students called their moms and huddled in dorm rooms. It was so far away, yet so near. Living in Washington, D.C. for this anniversary gives me a totally different perspective on that day. Many of the people I now know lived here then and were mere miles away from the Pentagon when that collision happened. From DC to Pennsylvania to NYC, it literally and figuratively hit closer to home here. But the resulting shock wave hit us all. It’s also interesting to know that I sit in my office just three or so miles from where people are gathering and rallying near the Capitol. No matter your take on the event, we all still remember. And we should not forget. I realize that, just as the impact of Pearl Harbor pales in the minds of our generation compared to those of The Greatest Generation who lived it, September 11 will necessarily mean something else to our children and grandchildren than it means to us. But we will teach the coming generations about it, so the lessons learned and lives lost will not be forgotten. We will teach them so the freedom of our way of life, and threats against it, will never be taken for granted.